Right. I had a nice shiny master sculpt ready for molding. 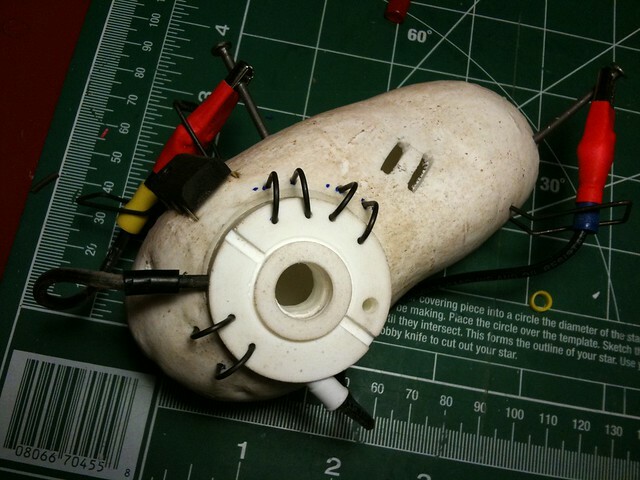 This entry will provide some details on the molding process and start laying out the details on the electronics. 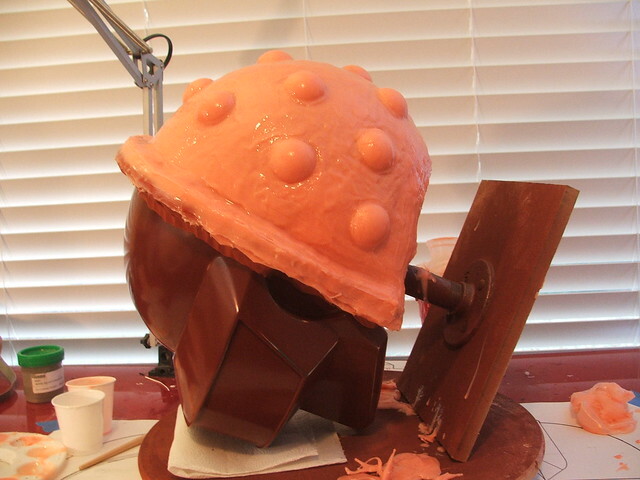 To start with, I had to seal off some of the thin areas and unfinished undercuts on the helmet. 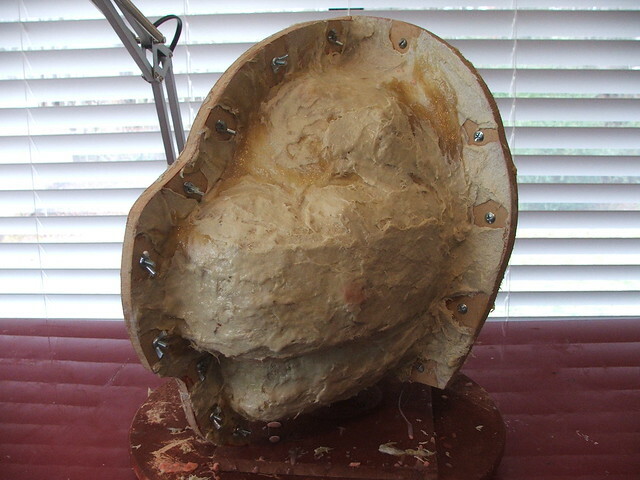 The bottom side got built up areas around the backsides of the ear cutouts as well as the chin - these were done with clay and some scrap styrene. 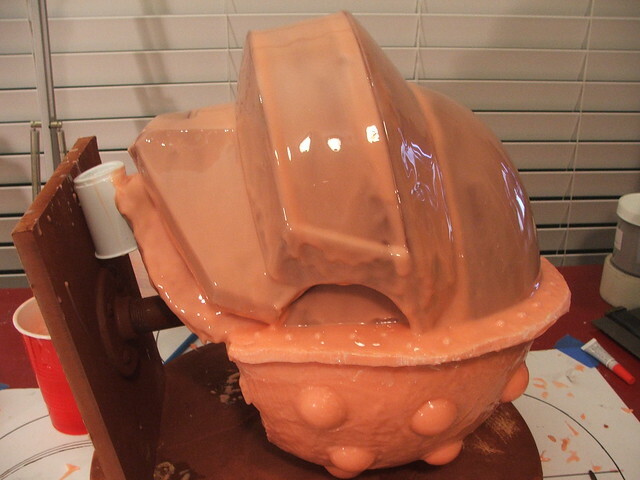 This mold is going to be a 2-part. 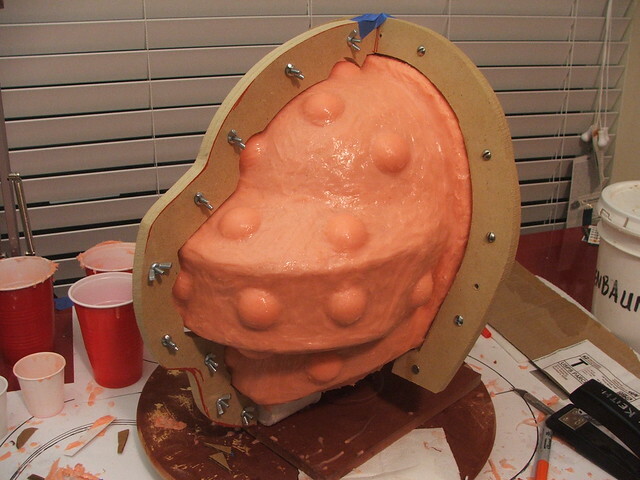 I learned from the Guy mold that single-piece jacket molds are very difficult to remove the cast parts out of once you're finished. 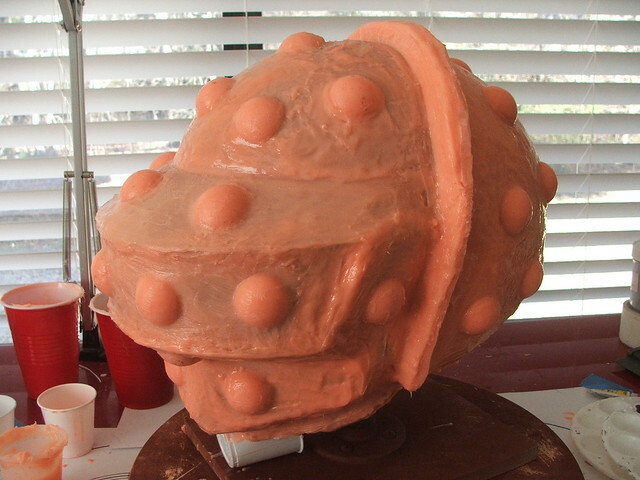 Thomas' mold will have a front and a back section, which will make removing final pieces much, much easier. You can see the clay wall separating the front and back halves in this shot. 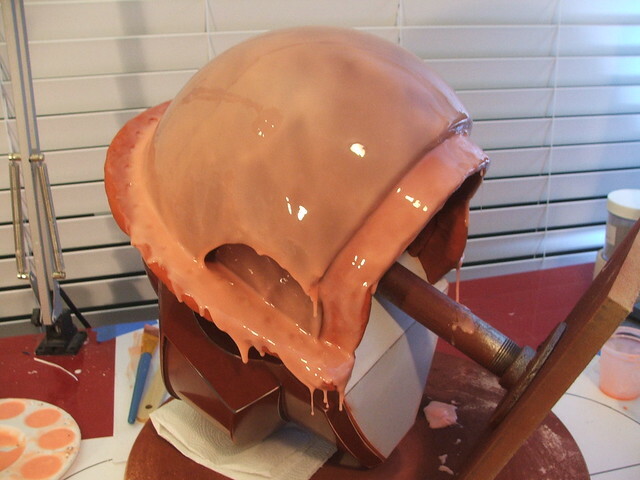 This pic also shows the first part of molding; a layer of silicone mixed with silicone thinner to create a "print coat" - this helps to ensure no bubbles are trapped in the final mold. 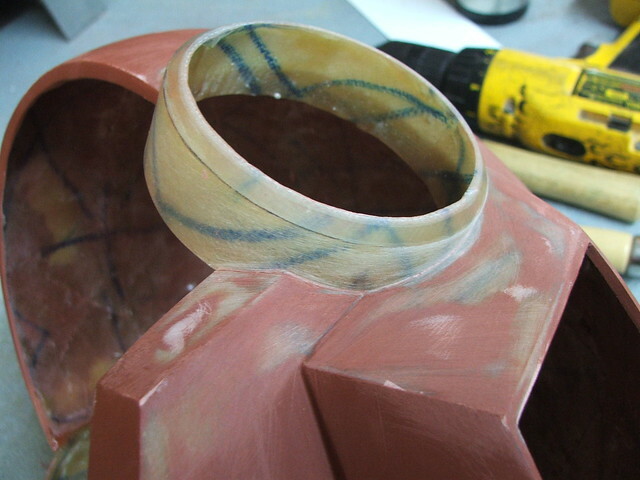 I'm using Smooth-On's Rebound 25 for this piece. I'm trying something a bit different with the registration keys this time. On Guy, I made them from thickened silicone sculpted into pucks. This works fairly well, but sometimes the rough surface on the pucks themselves causes them to push a couple millimeters out from the mother mold. 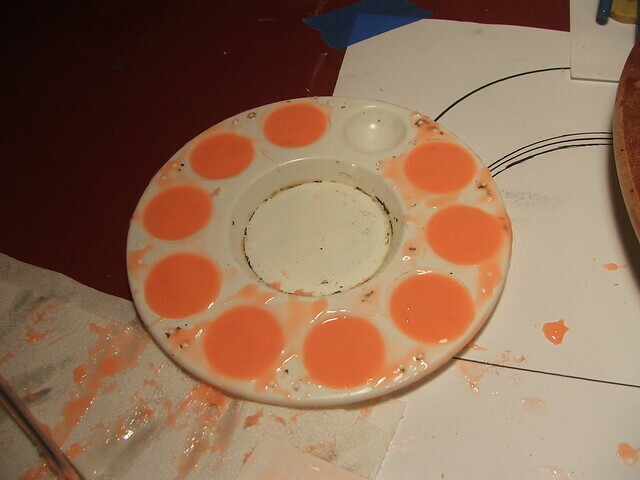 This time, I took a paint palette and filled it with excess silicone as I was making the first coats. These little egg yolks were popped out when still slightly tacky, and "glued" to a tacky brush coat with some more thickened silicone. Just as a warning, I did get some small air bubbles trapped behind these in a few spots - if you employ my methods, its best to place these in on top of a wet-ish coat of silicone to make sure you don't get any trapped air. I used 15 of the little bumps in all on the back half, and they're nice and smooth so hopefully they'll keep registration better than their hand-sculpted predecessors. After waiting 24 hours for the back half to dry, I started work on the front. 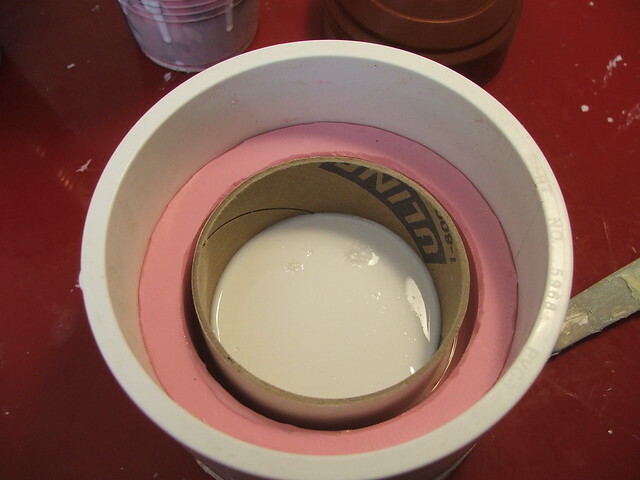 Keep in mind that silicone sticks to silicone, so you'll need to put something between layers to make sure you don't glue the halves of your mold together. For separating the two halves, I use this cleaner wax. Smooth-On makes stuff called "Sonite Wax" for this specific purpose, and when this tub runs dry, I might look into that. For now though, this stuff works great. Make sure to test homebrew stuff like this first! 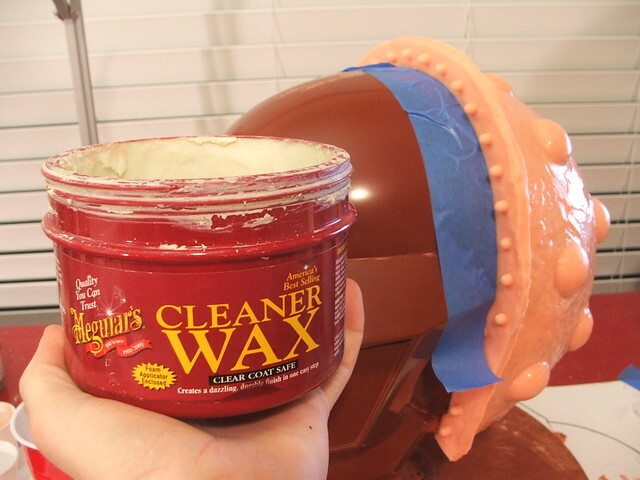 The line of painter's tape on the helmet in the background is to protect the primer, as this cleaner wax will dissolve it and damage the finish. Always test first! 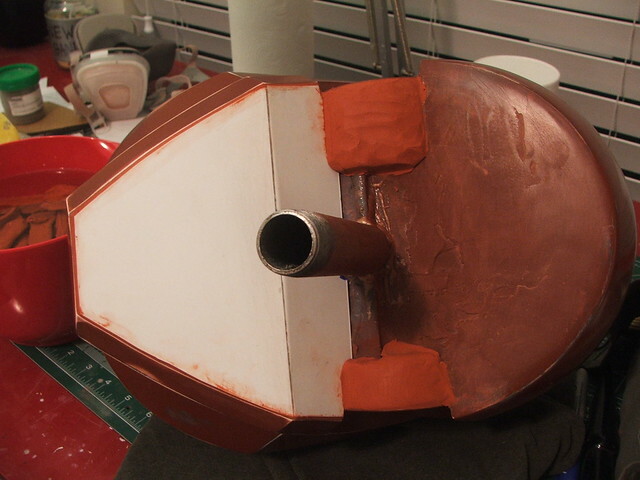 In prep for molding the front, I added a filler panel underneath and some clay dams along the chin. I also added a small "maker's mark" which will be trimmed off in the end. Not sure how much plastic will even get to this spot, but oh well. After that it's print coat, thickened coat, and keys. Second verse, same as the first. 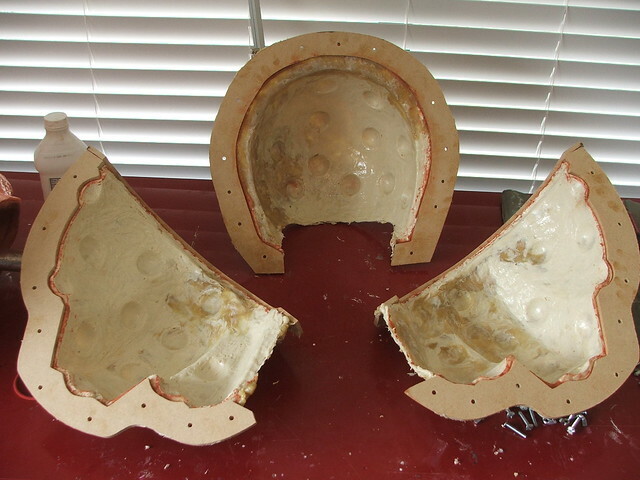 The MDF seams in this shot will be for the mother mold. 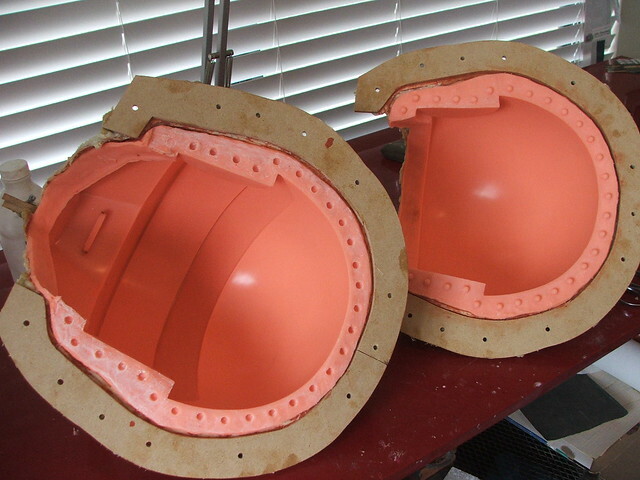 These will make a more even flange, ensuring the sections of the mold jacket stay aligned. 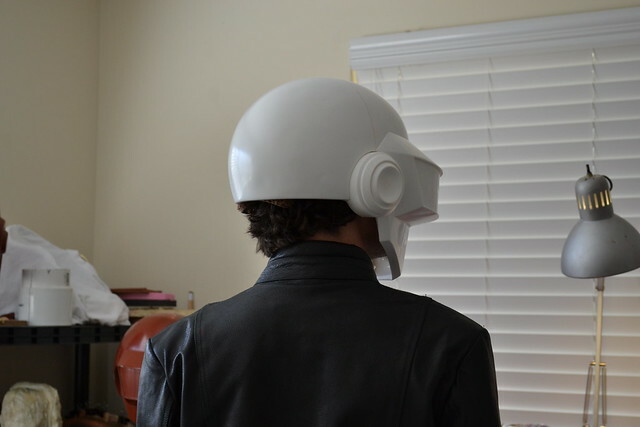 The front part of the helmet is split into 2 mother mold halves as well - similar to how my Guy helmet has one front section and 2 back halves. This was made from 1/4" MDF and secured with a crapton of wingnuts and screws. 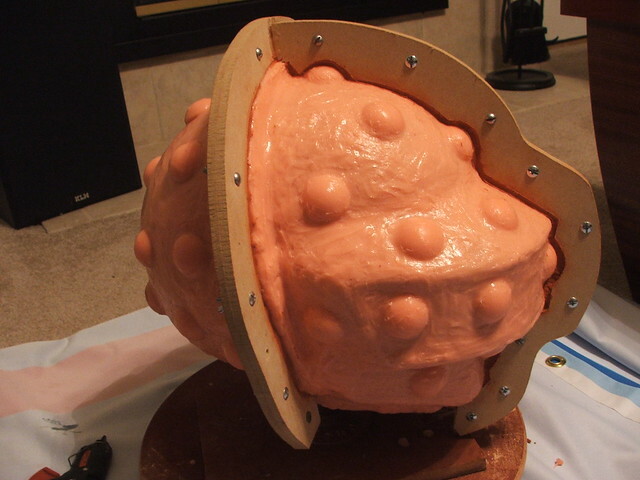 For the mothermold, I decided to use Smooth-On's Plasti-Paste again. 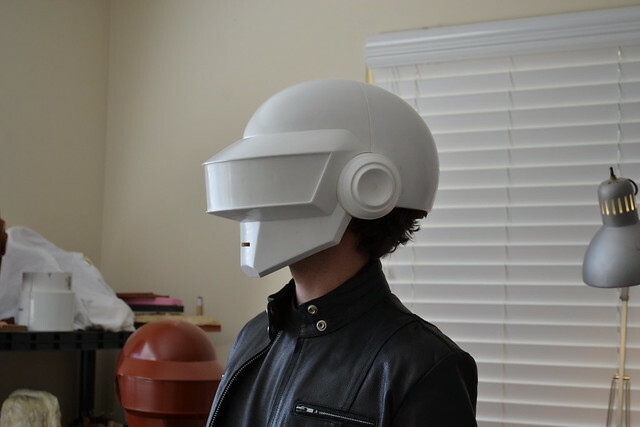 This one is a fair bit thinner and smoother than the one I made for the Guy helmet, so its a lot easier to pull copies. 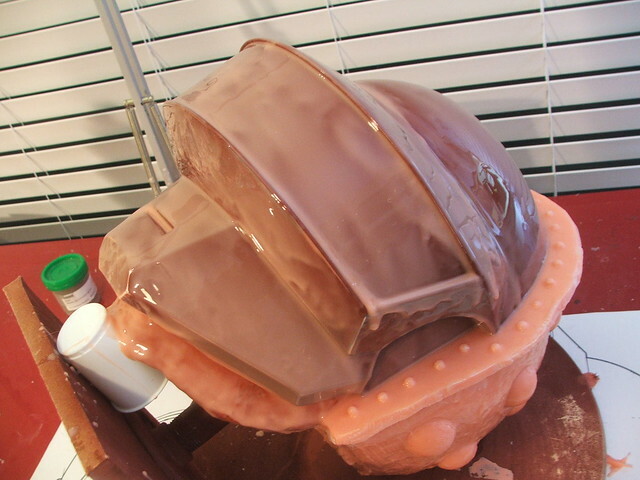 The mothermold sections removed, showing detail on the inside. 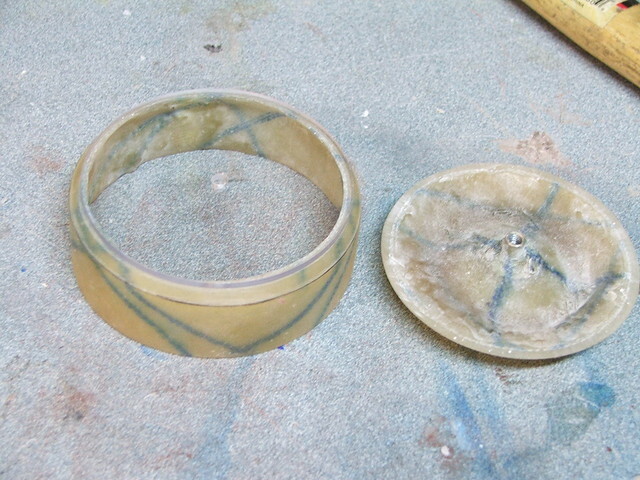 The MDF rings make re-aligning the sections much, much easier. I think I'll be doing this technique from now on. 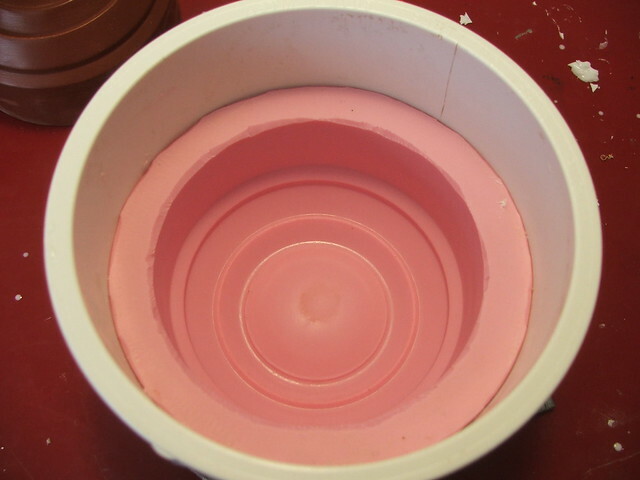 Interior of the Rebound-25 mold. Great detail. There are a few small areas where some air was trapped under the registration keys - most notably on the right cheek. In the future, putting some thickened silicone underneath these will alleviate this problem. 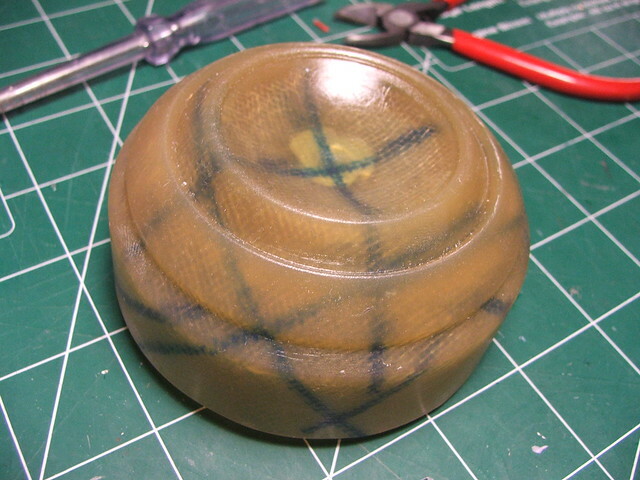 It makes for about a 1/32" dent in the final casting, but nothing a small spot of filler can't fix. 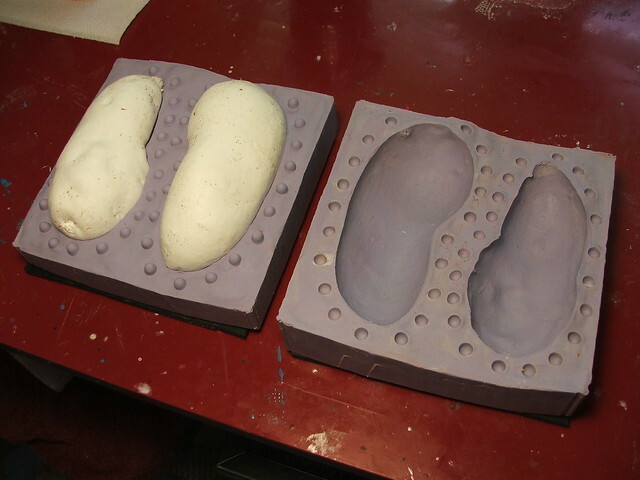 The ear puck molds were much simpler. 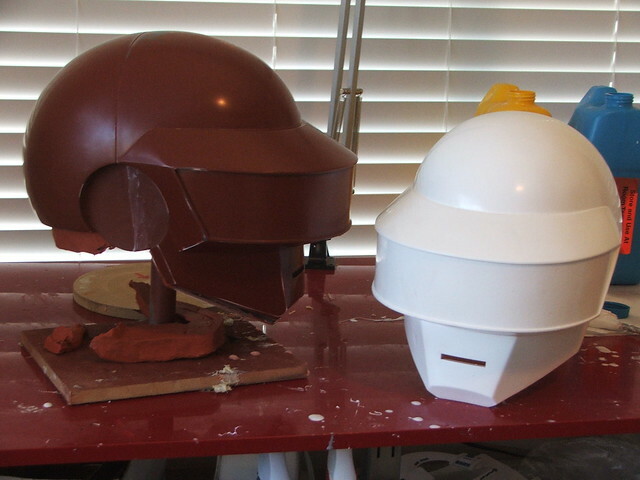 For these, I used a piece of PVC pipe as a mold jacket and glued the ear puck to a base made out of MDF. 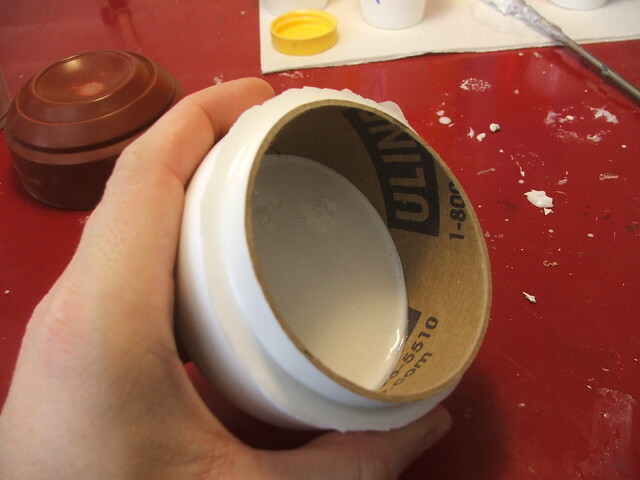 This was filled with Smooth-On's Mold Max 30. Pop the master out and voila! 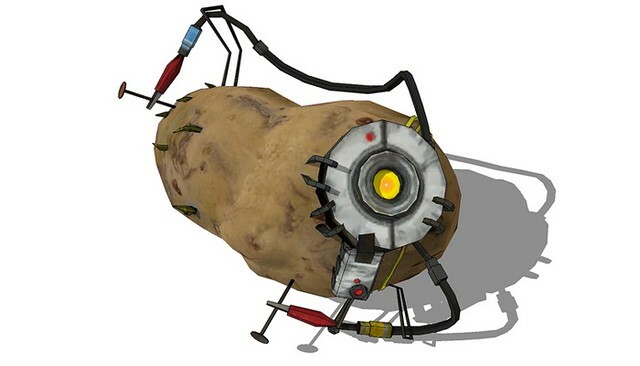 To cast these, I employed a trick I learned when making the barrel for my Portal Gun. 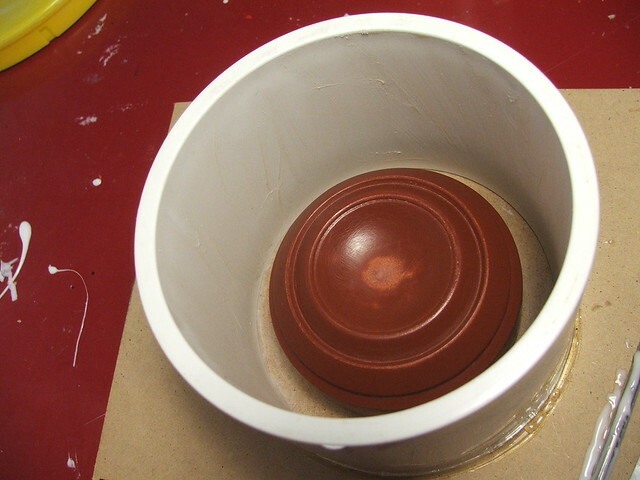 To make the ear pucks hollow, I've poured about 1/4 cup of resin into the base of the mold and allowed it to cure around a cardboard ring. 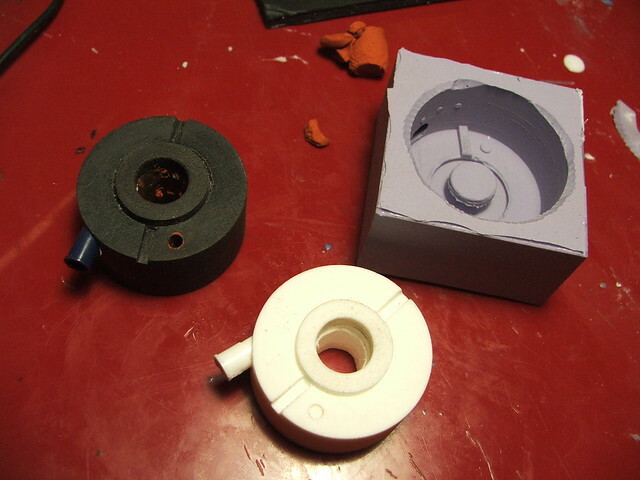 Once the lower section cures, you fill in the cavity between the ring and the mold, and BAM - hollow cylinder. 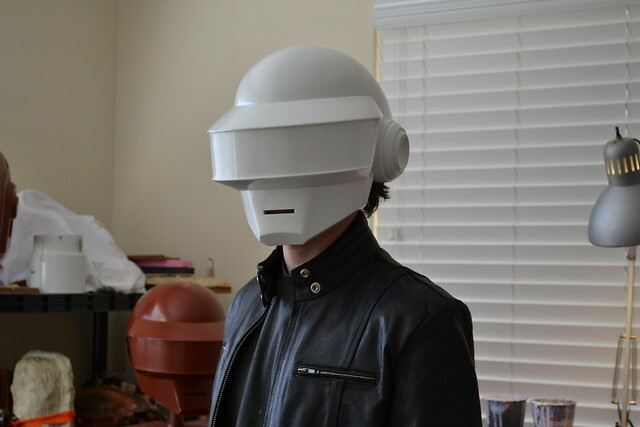 And, lastly, some shots of the helmet with the ears inserted. I can't tell you how happy I was when they just plunked right into place. Almost as if I knew what the hell I was doing. 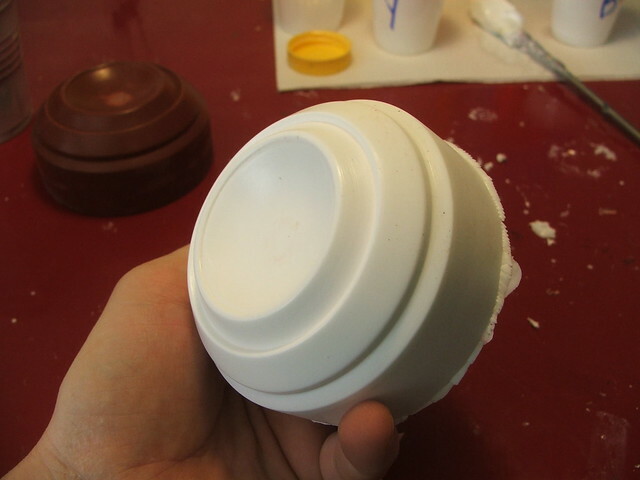 The white casting above was done with Smooth On's Smoothcast 65D rotocasting urethane plastic. 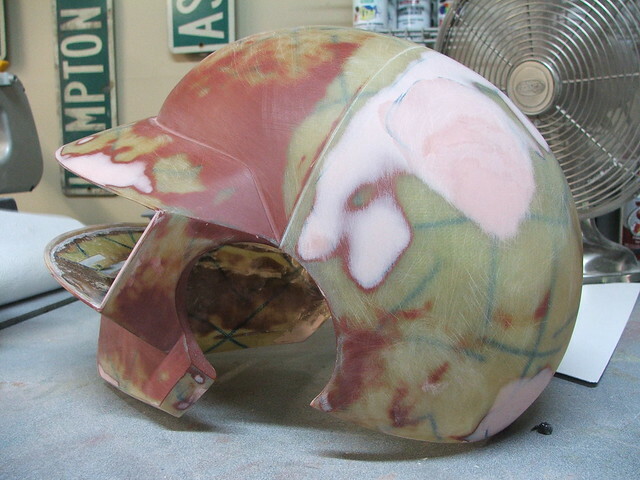 This caused issues with the Guy helmets in the past, as part of the chroming process involves a high-heat baking. 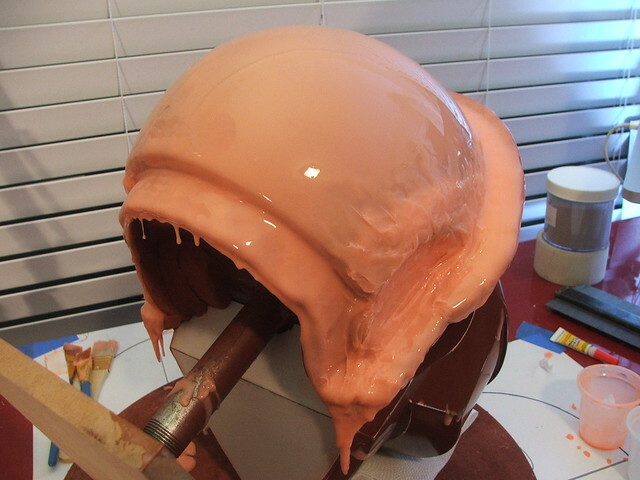 A byproduct of this was some sagging in the urethane plastic, and I ended up losing about 4 helmets to various deformities. The guys at Creations n' Chrome did come up with a solution to this issue, and were able to send me a couple flawless pieces by the end of things. 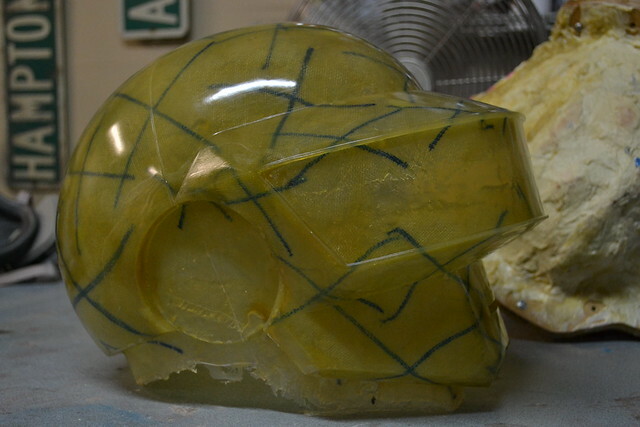 This time though, at the recommendation of my friend David over at 2 Story Props, I decided to try casting in fiberglass and polyester resin. The benefits are much lighter weight castings, much thinner, and nearly impervious to baking heat. David has some good tutorial videos up showcasing his process. You can check these 3 vids out here(1) here (2) and here (3). 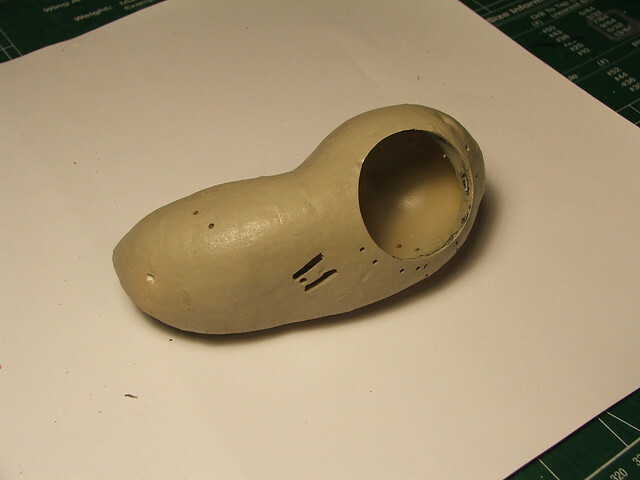 Fiberglass casting is a totally new experience for me, and the cast parts were probably a B+ success. Not bad, but I still have a lot to learn! The "X" markings are to show me where I've laid down a second coat of fiberglass cloth, making sure I've got a durable, thick and strong cast. 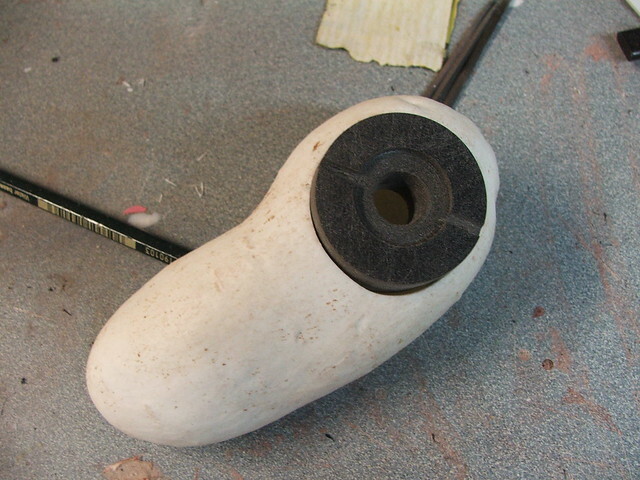 The ear pucks were done in a similar manner, with a T nut inserted into the fiberglass for mounting them later. 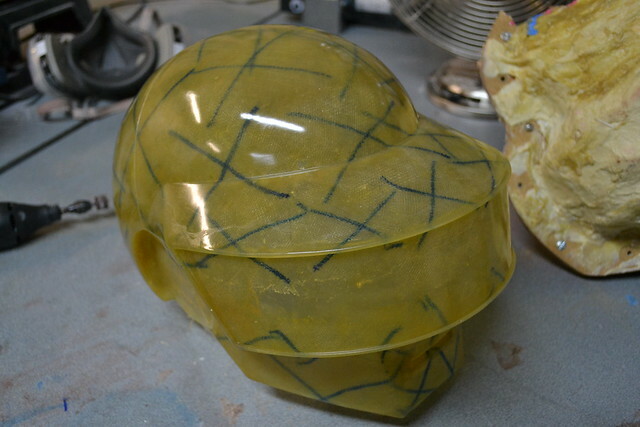 The ears will have the ring of lights embedded into them, so they were cut in half and the base piece was glued into the helmet base. I swear this will make more sense later! 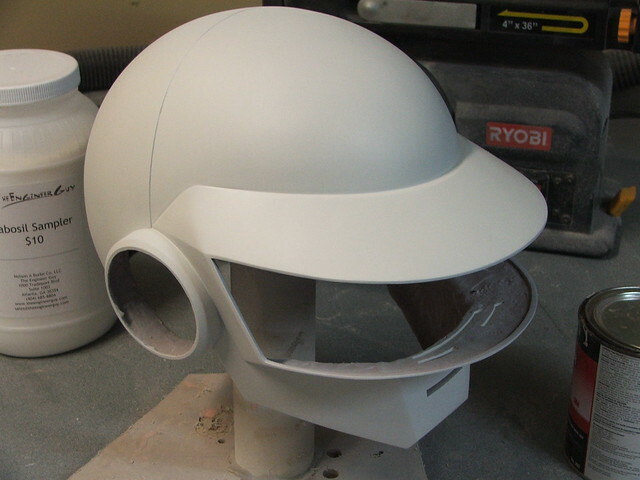 You can see there were a few spots where the helmet needed a little bondo work to get right. 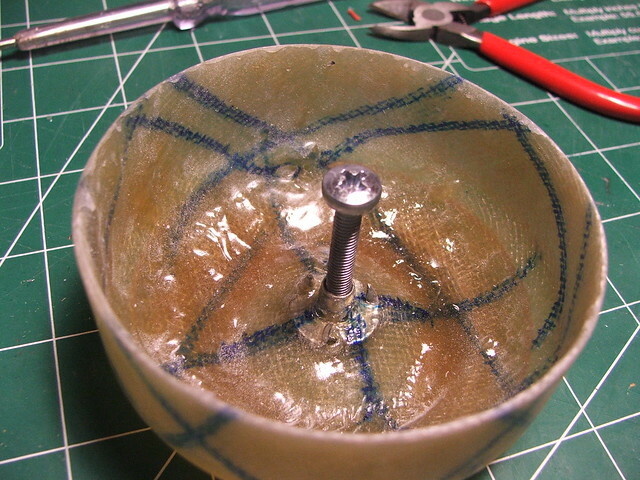 The polyester resin pulled away slightly from the mold while I was making it, resulting in odd little dents here and there. After plenty of sanding, filling, priming, and more sanding, the final coat was wet-sanded down to 2,000 grit and sent off to Creations n' Chrome for its very special and very shiny topcoat! 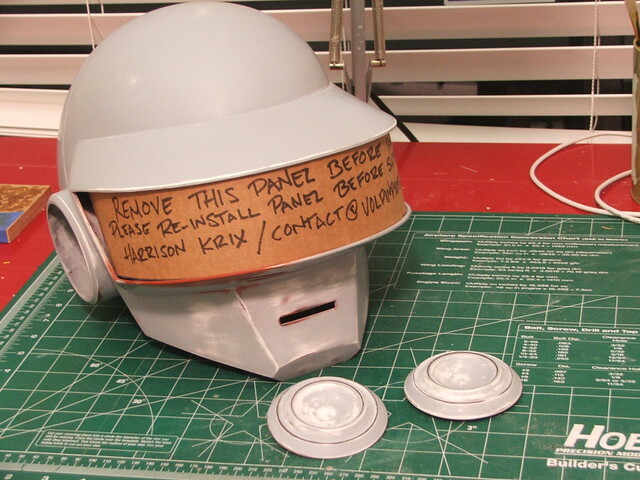 The cardboard panel in the visor area makes sure that no pressure during shipping is transferred to the thinner areas around the visor and nothing cracks on his cross-country journey. 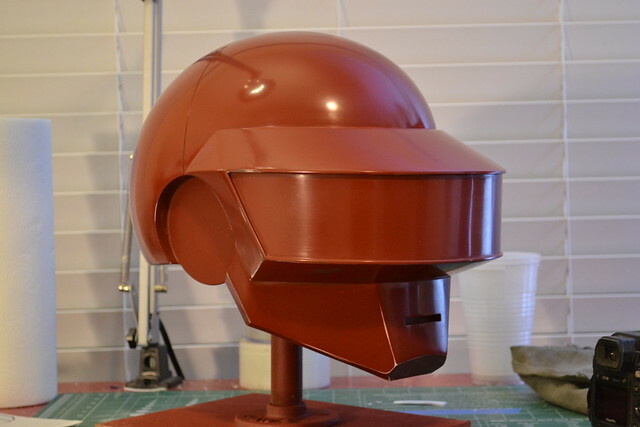 Part 3 will cover the final chromed helmet as well as the most complex electronic project I've ever taken on. 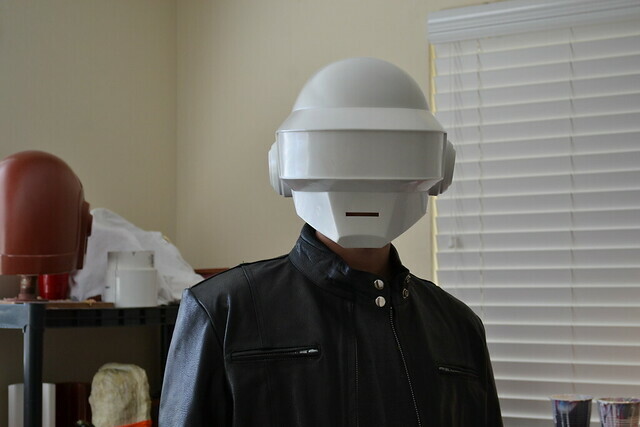 496 LEDs! WOO. As always, there are more pics available on my flickr page. Also be sure to check out my YouTube for updates and videos! This was a fun project, done as a small add-on to the third (and final!) 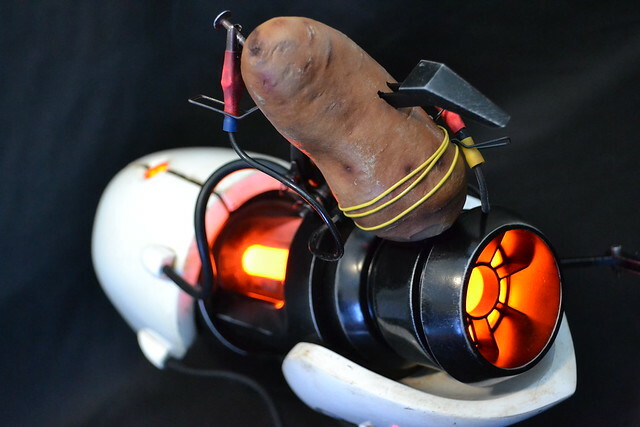 Portal Gun commissioned by the guys at VALVe Software in Seattle. 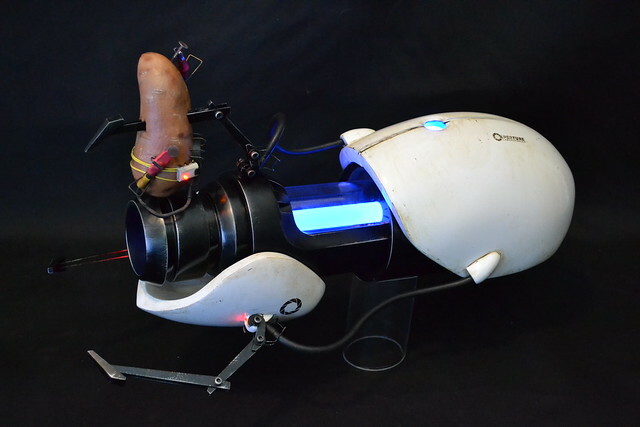 While the additional potato-GLaDOS wasn't a requested item, the release of Portal 2 prompted me to put one together before delivery. 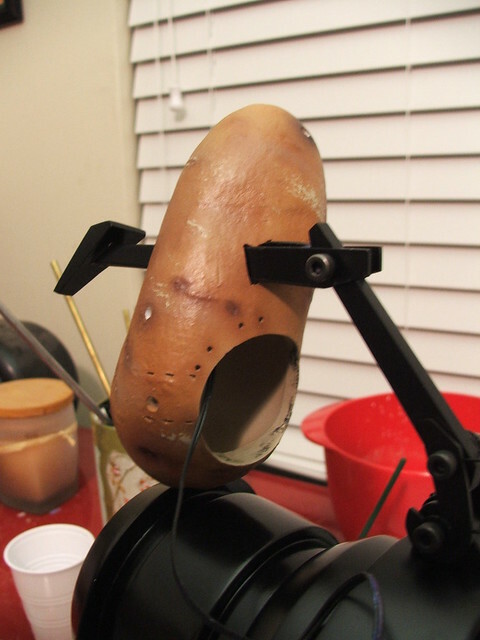 Due to the very short timeframe, I opted against sculpting a potato from scratch. During a grocery shopping trip, my wife scoured the produce department to locate two likely candidates to live on the end of the ASHPD. 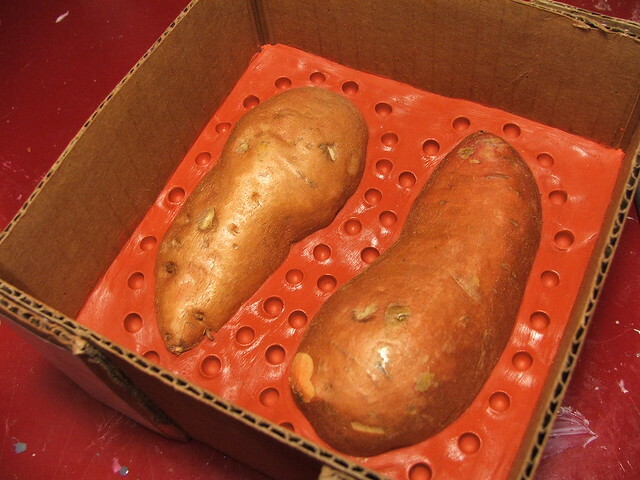 These two spuds were tossed into a mold box and molded in Smooth-On's Omoo silicone. If you're noticing the lack of a pour spout, these were designed to be hollow cast pieces. 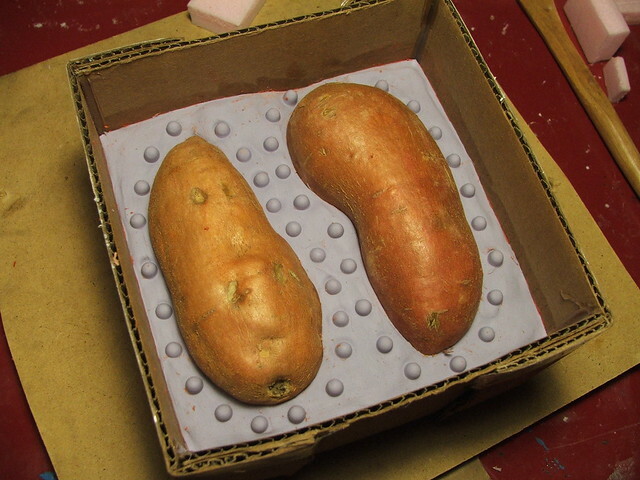 Once resin was added, the potatoes were slush cast in 65D resin to make lightweight replicas. 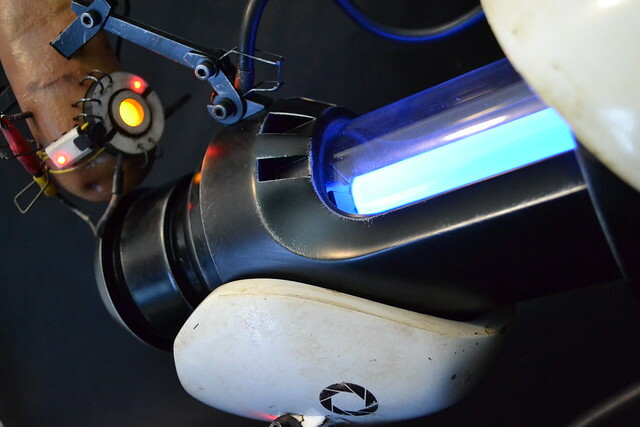 GLaDOS's "eye" was made on a lathe using laminated sheets of 1/2" sintra. 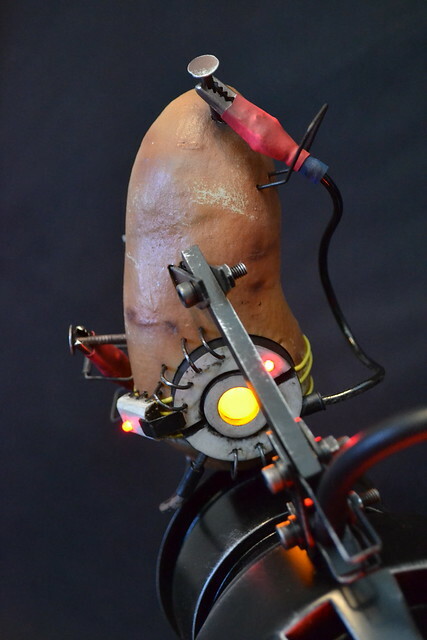 The oversized chip on the side of the potato was cut from sintra as well. 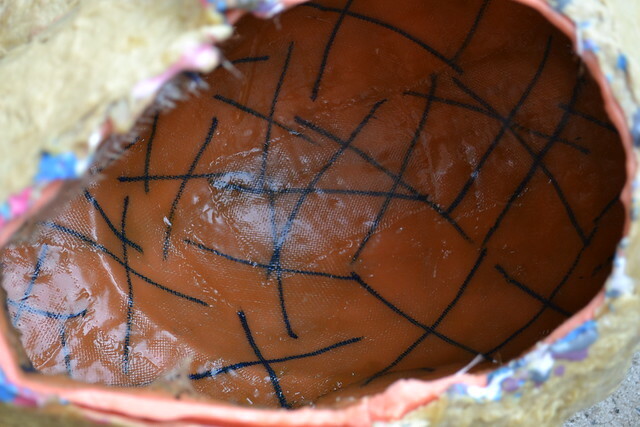 Smaller details were added with wire and roofing nails. The whole of this build is mostly stuff that can be sourced at a local hardware store. In order to keep the scale correct, some things (like the alligator clips) had to be cut down. 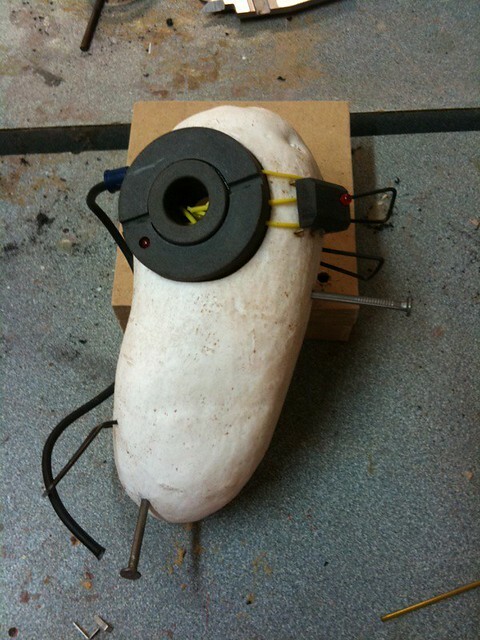 The eye of the potato was molded in more omoo and cast with SmoothCast 300. After this, more wire details were added. I found a textured Krylon tan paint that worked pretty well for a basecoat. The surface had a sort of satin feel to it. 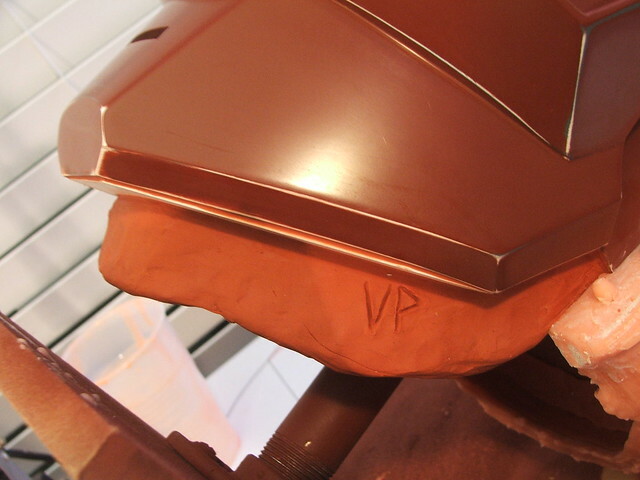 Layers of dirt and discoloration were added with an airbrush and acrylic paint. I found that lightly scraping the high areas with a damp paper towel pulled this color off and simulated peeled potato skin rather well. 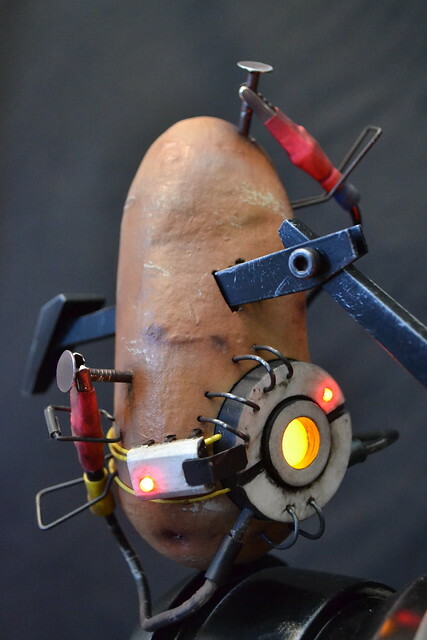 I wish I had taken time to document the rest of the build, because things take a bit of a jump here - unfortunately, my short timeframe meant that I spent more time cranking on the little angry spud and less time behind my camera. Illumination was provided by two 5mm yellow LEDs and two 3mm red. 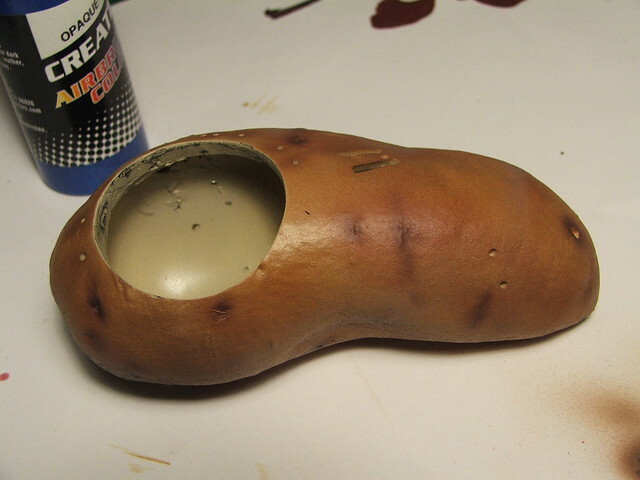 These are routed in the hollow cavity of the potato and shine through the chip and eye area. 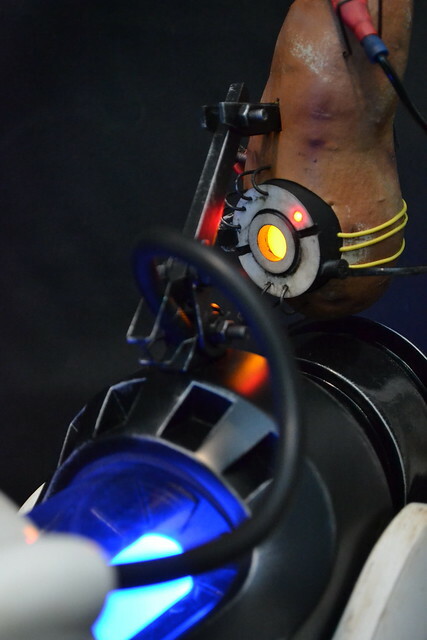 More acrylic paint was added to the nails, alligator clips, and eye to weather the piece to match the (by now) ancient Portal Gun. 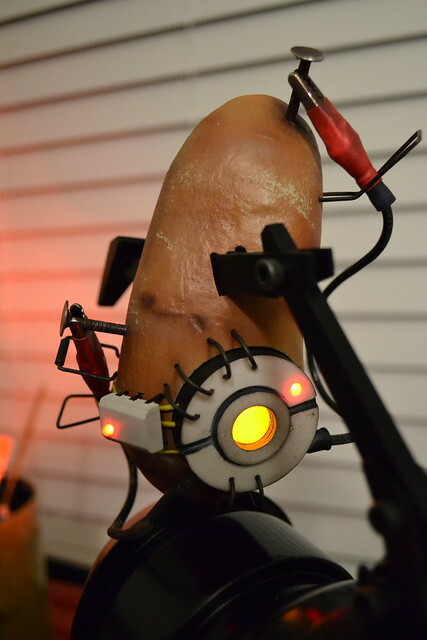 Better video will be coming soon, but potato GLaDOS is capable of speech! Until then, enjoy these final product shots. The completed gun now lives at VALVe HQ, make sure to say hi if you ever get a chance to visit! More pics available on my flickr page, thanks for looking!